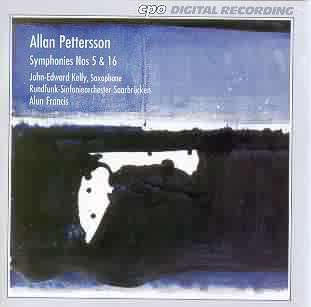 Pettersson's Fifth was the last symphony he was able to write out in his own hand before polyarthritis struck home. It is in his accustomed, massive, single movement. The work opens in the quietest of whispering mysteries, punctuated with stabbing figures, tolling and tumultuous brass and strange bird and insect calls. The symphony marks his middle period spanned by symphonies 5-9 of which all but No. 8 (in 2 movements) are single movement monoliths. It was premiered in November 1963 conducted by that one-man giant of the Swedish international musical renaissance, Stig Westerberg. However the success of this performance had little stamina and Pettersson had to wait until the celebrated Dorati performances of No 7 (a work whose weary repose is prefigured at 31:00 Track 1) to make any real headway. Symphony No 16 was written in the same year as another concertante work: the viola concerto. It was written at the request of the American saxophone virtuoso, Fred Hemke whose recording is on Swedish Society Discofil coupled with the 7th symphony. When the CPO soloist saw the work he noticed how the saxophone part did not fully exploit the instrument in Pettersson's own terms. With the permission of the publishers he prepared his own edition which is recorded here. The characteristic sax-wail seems entirely in character with Pettersson's gale-tossed turmoil, breasting the hurricane like a sea-bird. The territory is familiar. There is little peace in the work. The furious angst is alleviated by a second movement producing another of those wonderful Pettersson melody-laments. It is amongst his finest examples. This repose which is almost Bachian is surely what he envisioned for himself but, what puzzles me, is why he placed it second in the four movements. He veers into jazz territory in the fourth movement. The instrument is always heard as it cavorts, spurs, goads and leads the orchestra. This is a very tuneful score and one of Pettersson's most accessible. Those who have enjoyed other modern sax concertos (e.g. Michael Nyman's Where The Bee Dances) would do well to give it a spin. There are other recordings of these pieces though I have not heard them. No. 16 is on Discofil and probably in a different version so is not directly comparable. The Fifth Symphony is on BIS and also on another level with a German youth orchestra. Both performances have been praised elsewhere but I cannot imagine either of them being markedly superior to this one. The Saarbrucken players and Alun Francis seem to have no shortage of commitment and passion. The recording is fine and the notes are very thorough as is true of all this series. I did not however understand why the fifth symphony was allocated only a single track when (helpfully) CPO's CD of Nos 10/11 divided each work into five tracks separated by bar number references. It is a sobering thought that CPO are now within hailing distance of a complete cycle. Only the fragments of 1 and 17 and the whole of number 12 to go!